Malmstrom confirms UK will be involved in the EU-US trade talks now that Article 50 has been extended: 'As long as the UK is a member of the EU they will of course be adequately informed and engaged as any other [Member State].' How active UK will be though is another question. 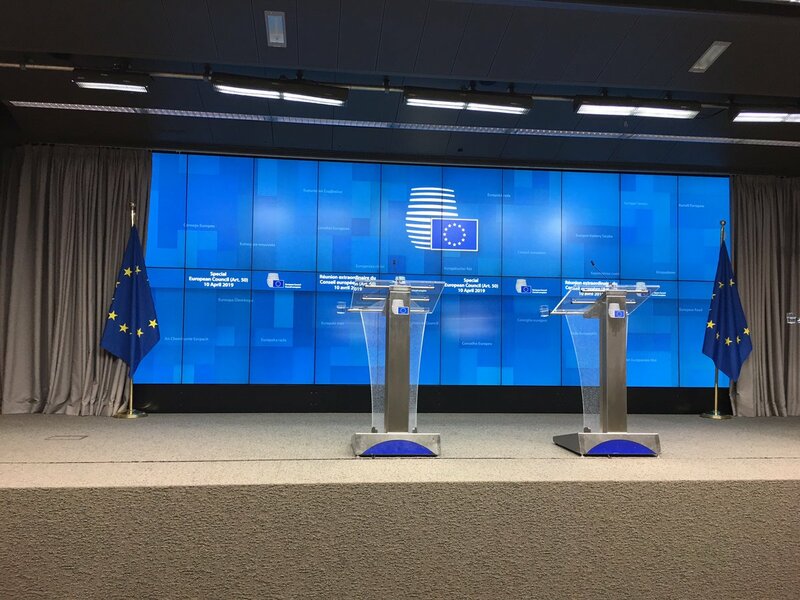 Awaiting press conference with Presidents Tusk and Juncker. Not really sure why to be honest. It’s 2.15am. Should definitely be enjoying a beer instead. EU agriculture Commissioner Phil Hogan says last year the bloc had a 25bn euro trading surplus with the UK in agricultural products alone. That's higher than its entire surplus for trade in all products with the rest of the world, which was 21bn. 2 ways of looking at this. Yes it does show huge importance of UK as market for EU goods. But that dependence runs in other direction too. And it demonstrates how commerce with the rest of the world is still a drop in the ocean compared to trade with nearest neighbours in Europe. EU official: 'UK is hugely reliant on imports from EU & for particular products eg fruits & veg. There's no alternative ready source so there's an interest in ensuring this trade can continue.' Eg Spain exports 3bn a yr fruit & veg. 90% of UK mushrooms come from Ireland & Poland. EU ambassadors met today to discuss options for an extension. 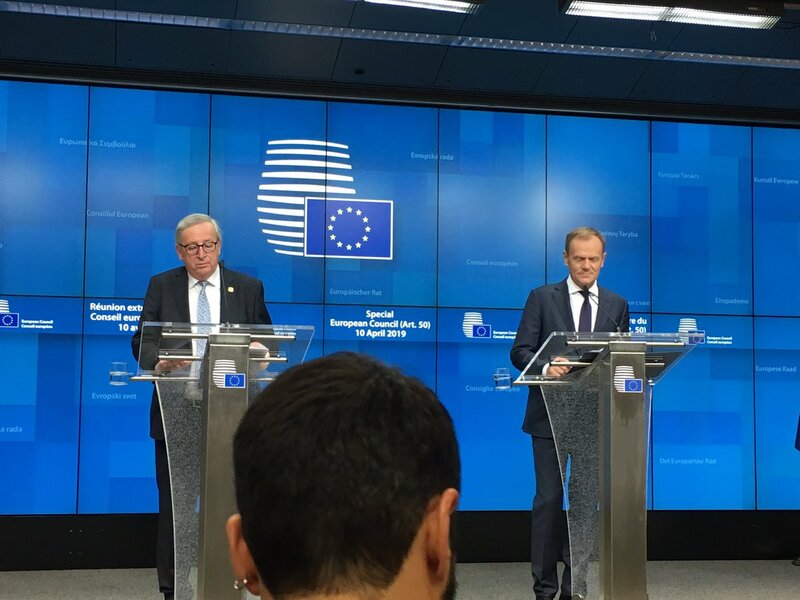 Germany & Netherlands were open to Tusk idea of year-long delay. But France, Spain & Belgium were 'very hard' & argued May hasn't done enough to justify one. They floated 2 week delay to prepare markets for crash out. Balance of probabilities still favours 'flextension' of somewhere between 8-12 months when EU27 leaders get together next Weds. 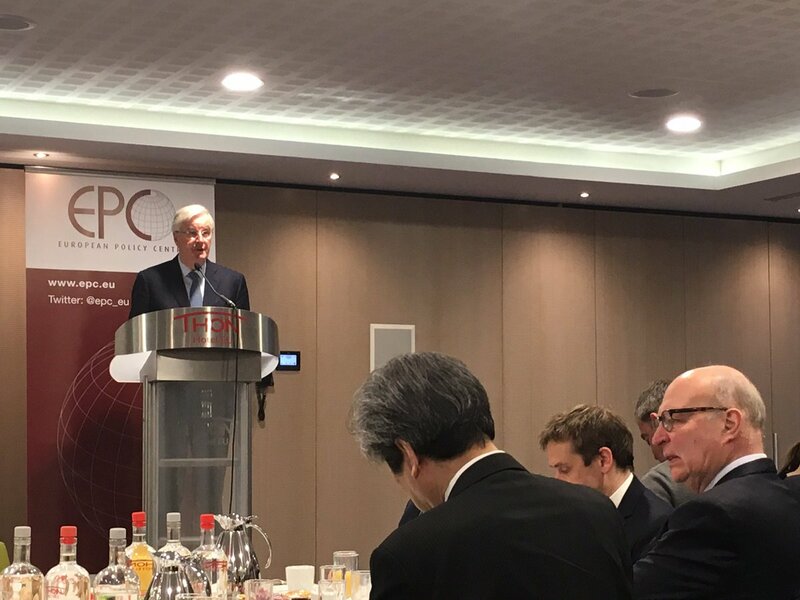 But France in particular will demand very concrete political commitments from UK that it won't use a delay to interfere in decisions about EU's future. Idea of long extension is to pack UK 'off to garden shed' for few months to get head straight & sort out internal political crisis in hope May (or another PM) will be able to come back at end of year with better idea of what it wants. Also takes Brexit off EU agenda for a while. Gibraltar/visas update: Spain will attempt to get Labour's Claude Moraes removed as head of EP's Civil Liberties Ctte today to 'pave way towards adopting Spanish position on Gib' being a colony, says source. EP position is Madrid's language, backed by Council, is 'unacceptable'. Reminder why this is important: Legislation currently being blocked is EU decision to place UK on its visa exempt list of 3rd countries if there's a no deal Brexit. Unless that legal step is actually taken Brits would require £52 visas to visit the continent as early as April 13. Most other Member States are exasperated/angry at Spain & think it's behaving ludicrously. But once more shows very strong club mentality of EU. Other 26 may think Spain is being 'insane' as one diplomat put it to me, but they're still backing it over UK as it's one of their own. EU ambassadors meeting in Brussels today discussed what their new negotiating demands will be if UK asks to reopen talks after a no deal Brexit. Top of their list: UK must 'fulfil its commitments under the GFA' [accept the backstop] and 'honour its debts' [pay the divorce bill]. Remember EU's contingency measures covering areas like aviation, haulage and customs are unilateral and most only last for 6-12 months. So the presumption here is UK would have to come back 'pretty soon' asking for them to be rolled over or for new mini deals to help its economy. Ambassadors were concerned this could present a new threat to EU unity so wanted to strike a common position early. Decision making on extension has been handed over to leaders' chief advisors in national capitals, demonstrating it is now a wholly political rather than issue. Context on what Barnier means - he's talking about EU pledge to carry out as many checks as poss away from geographical border under no deal. But unlike in backstop checks would still be needed on everything crossing between NI/IE. Would still have to be physical infrastructure. EU types thus perplexed by people in UK questioning why no deal planning can’t replace backstop, because they say it doesn’t fulfil anything like same function. One says situation would be ‘fundamentally different’ under no deal and there would be ‘great uncertainty’ for IE/NI. Tusk adds Remainers in the UK 'may feel that they are not sufficiently represented by their UK Parliament, but they must feel they're represented by you in this [EU Parliament] chamber because they're Europeans.' He is heckled by eurosceptic MEPs. EU Commission announces this morning it has 'completed' its no deal planning and warns it is 'increasingly likely that the United Kingdom will leave the European Union without a deal on 12 April'. Commission says Brits travelling to the EU would 'be subject to additional checks when crossing borders into EU'. It says despite 'considerable preparations at ports and airports to ensure that these checks are done as efficiently as possible, they may nevertheless cause delays'. Only plan May outlines here is getting EU leaders to sign off on legal assurances before MV3 (they're reluctant to do so having been burnt so many times before) and new national legislation replicating ditched Para 50 from the Dec 2017 joint report. Unlikely to cut the mustard. It's a good thing we're not playing the Barnier Bingo drinking game right now, because we'd all be absolutely paralytic. 1/ As we await yet another pronouncement on the backstop that will doubtless be immediately dismissed as insufficient by the usual suspects, worth quoting what a senior EU diplomat from a Member State pretty neutral on Brexit said to me the other day when I asked if it's a trap. 2/ Firstly, they questioned why on earth the EU would want to do that and how it's in the bloc's interests: ‘The backstop solves 5% of the issues between the EU and the UK. What about trade, defence, security, all services? Why would we be content with 5% and not strive for 100%? 2/ First, the UK offer. The Attorney General tabled proposals for a new, independent arbitration system to rule on when the backstop could be ended. He said the question it should be asked is whether the UK had shown sufficient good faith in coming up with alternative solutions. 3/ If this arbiter said Britain's efforts on alternative arrangements and attempts to strike a trade deal with the EU had been good enough both sides would enter what Sabine Weyand dubbed the 'mini-backstop' - a stripped down backstop only addressing border infrastructure. Commission spokesman adds that Barnier 'offered ideas on how to give further assurances' that the backstop will only apply for as long as necessary, unless and until it can be replaced by a future trading relationship. He adds that further technical talks will carry on all week. Internal row brewing between Council/Parliament vs Commission over creation of new EU Space Programme & post-Brexit UK's place in it. Member States & MEPs have agreed on it. But Commission seems to fear it could open a loophole for UK to keep decision making powers on Galileo. Or in plain English, the UK & EU looking at setting out how the UK can use the good faith obligation in the (legally binding) Withdrawal Agreement to challenge and exit the backstop if the two sides don't agree a trade deal along the lines of what's in the Political Declaration. Worth remembering review clause specifically states future UK-EU provisions could lead to backstop being superseded 'in whole or in part' depending on what criteria for avoiding a hard border they meet. So could end up in situation in 2023 where only part of backstop is applied. 1/ A common conception in the UK that fundamentally misunderstands both what the backstop is and what the EU's priorities are on Brexit. In truth, the backstop gives the EU almost nothing of what it wants from a future relationship with the UK. 2/ Firstly, the backstop only covers goods. Separating goods and services could open up a bit of a Pandora's Box for the Single Market. The EU's more service based economies are worried if it applied for any length of time this could be exploited by UK for competitive advantage. 3/ Secondly, it gives the whole UK access to the Customs Union without any agreement on fishing access to British waters for EU vessels. Quite a few countries - notably Belgium, France and Denmark - are hopping mad about this. They only get their access with a proper trade deal. Timmermans wraps up by saying that watching the last two years unfold in the UK has been an 'incredibly effective antidote against' calls for a Nexit in his home country. He says the idea of leaving the EU is now a 'sterile debate' in the remaining Member States as a result. This has been the political pathway to a deal for some time now. Interesting that May references the Juncker-Tusk letter from last month. The one saying the backstop ‘would only apply temporarily’ if triggered and that Selmayr hinted to MPs could be appended to the Withdrawal Agreement. Both sides also agree to explore ‘the process the Commission and the UK will follow’ towards the aim of alternative arrangements replacing the need for the backstop in a future relationship. So a detailed roadmap including commitments for working together on technological fixes. 2/ Diplomats and officials now predict little movement at all before the end of February. They privately describe the reopening of negotiations between Barnier and Barclay as ‘smoke and mirrors’ designed to buy the PM time. There will then be a 'frantic' period starting in March. 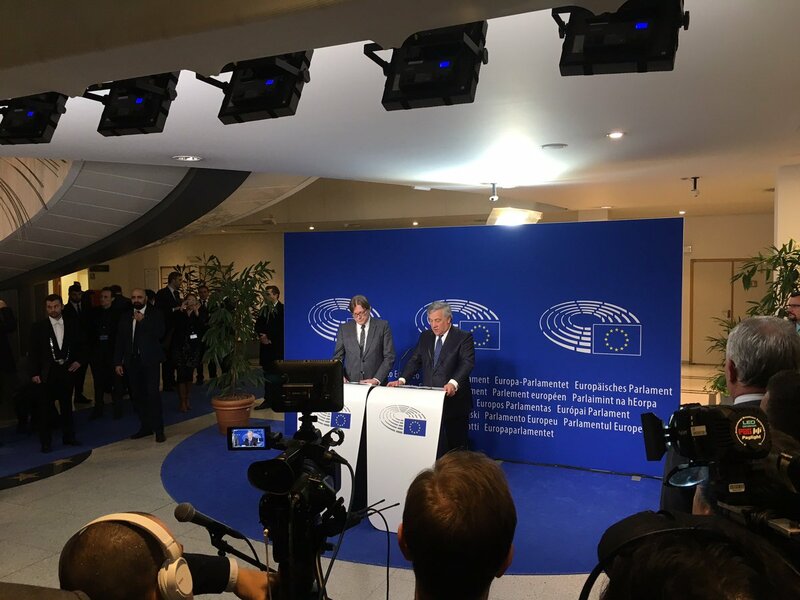 3/ EU capitals are looking at two things they can do. Firstly, those legally binding tweaks to the Withdrawal Agreement demanded by MPs. An avenue of exploration is adding wording to Article 20 of the Protocol on Ireland, known as the review clause.